I wasn’t that enthusiastic about visiting Fairford Church. I thought I ought to see it, as I knew it contained a full set of stained glass. But in pictures, the stained glass looked rather boringly didactic; endless rather featureless faces. Luckily, I happened to be passing on a trip to the Cotswolds. I was wrong. Fairford Church is a bit of a spiritual high! We can only really guess at the artistic wealth of England before the Reformation. We know, partly from the boastful diaries of Cromwell’s chief iconoclast, Dowsing, that we lost 97% of our art, including 90% of our stained glass. Dowsing and other systematic iconoclasts smashed their way through Britain’s entire visual heritage, and we can only piece together the fragments and wonder at what might have been. The glass survived rather better than anything else because it was needed for warmth and it was often hard to reach. Stained glass was expensive to replace, so parishes resisted having all their windows smashed for the most part. That means that we have a little more Medieval stained glass than we do anything else – perhaps 10% of what we would have had in the Middle Ages. I believe that by pulling together all the examples of stained glass of the Virgin Mary we can get the truest picture of what England’s artistic heritage would have been. The Virgin was a most central and beloved figure of Medieval devotion, and images of her would have proliferated in stained glass, sculpture and fresco. The Protestant reformers particularly targeted what they saw as Mary worship, but in stained glass they could not always reach and so images of Mary have survived. There are maybe 100 images of Our Lady across the country. Put them together and you can build a picture of England’s visual culture before the iconoclasts. The English now seem to have a blind spot for the Virgin Mary, yet she is the best place to start to understand English Medieval art is because she is such a poetic figure. In his outstanding book, ‘Mary for all Christians,’ John Macquarrie wrote that Mary represents ‘the poetry of Christianity’. She is the patron saint of artists, and she has always been a special inspiration for creatives. And where would be without poetry? 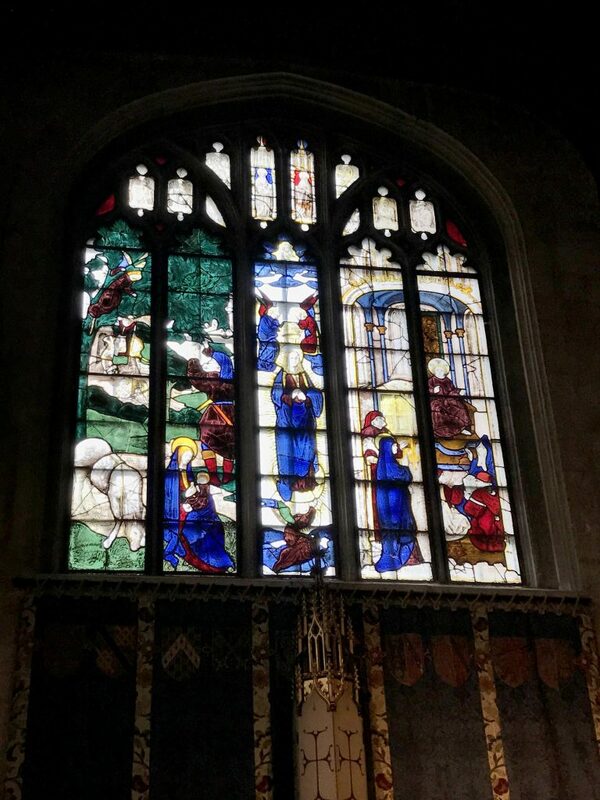 Fairford, therefore, is a bit of a banquet for art historians, being the only church in England to have a complete set of Medieval stained glass windows, including an entire Life of the Virgin. Created in 1517, the windows somehow, mysteriously, escaped the Reformation. It may have helped that Fairford is fairly out of the way and would have heard of the fate of other churches first. They would also have been very attached to their glass, which was only 15 years old at the time of the Reformation and presumably only just paid for. I think a clue as to why Fairford managed to retain its glass comes when you visit the church. 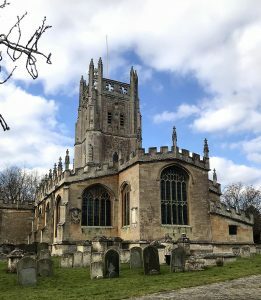 You find it fully staffed with enthusiastic, dynamic old aged pensioners who are clearly very proud of their church. It was the most alive Anglican church I have experienced in a while, and yet Fairford is such a tiny town. A prayer meeting was conducted in the chancel while I was there. If they are the descendants of Fairford’s Reformation parishioners, Cromwell’s reformers didn’t stand a chance. I imagine they quietly hid all the glass, negotiated, whitewashed and conceded the odd face of Christ in ruthless determination. We owe them a debt. Protestant reformers seem to have more frequently left doom pictures to terrify the congregations. Fairford confirms that this was not the focus of Medieval Catholicism. The Judgement is menacing, but it is a fairly minor part of the happy biblical depictions that abound in this church. 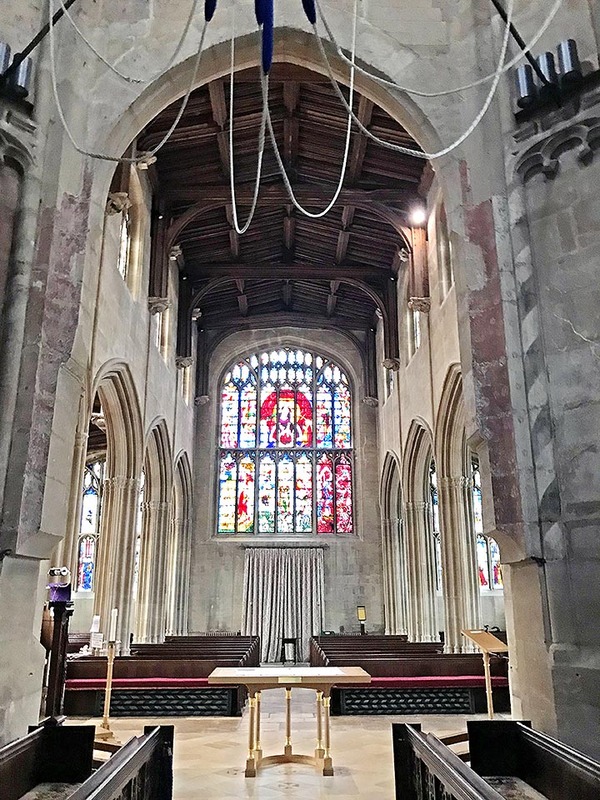 Because Fairford is the only church to have kept all it’s Medieval windows intact, it gives us the best chance to experience this aspect of Medieval art and faith as it was. To explore Fairford is to experience a quietly, gently, joyous Medieval spirituality of vivid colours. It is quietly encouraging. It asks, how will you respond to Christ, and which world will you choose? Christ on his rainbow, or the fiery furnace of hell? But the parishioners sit with their backs to the west window’s doom, experiencing an intricate rainbow world of heaven. The choir stalls are between the stone rood screen and the nave you can just about make out evidence of the rich colours that would have decorated this chamber originally. It must have been a psychedelic experience to hear the beautiful choir with the sun pouring through the merry windows. 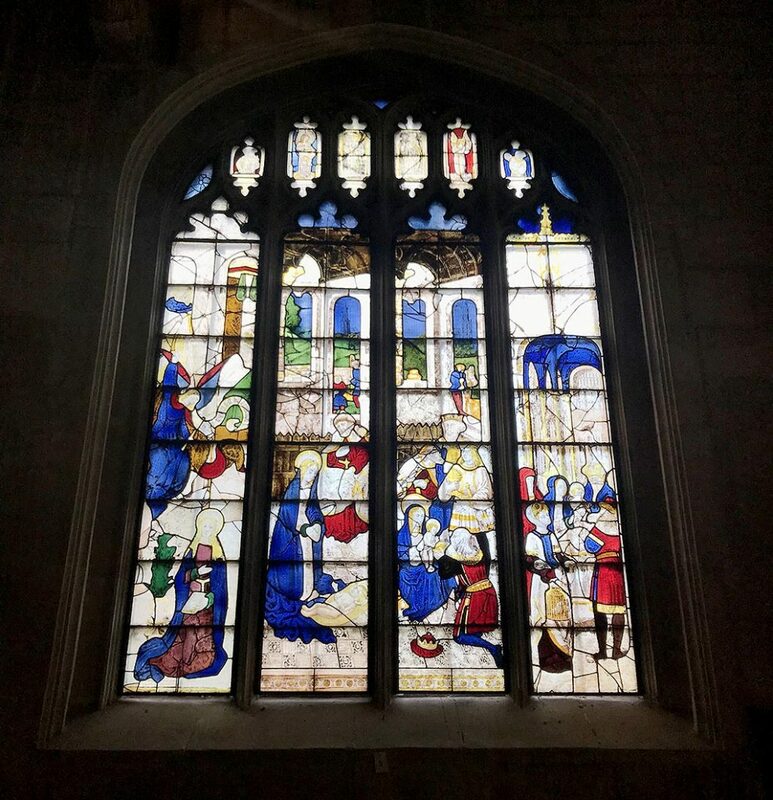 The windows in the Lady Chapel are very rare and show a complete set of scenes from the life of Mary, but sadly the Lady chapel is considerably darker than other parts of the church. Mary appears in a walled palace receiving the Angel Gabriel, and beside her is a large pot of lilies. There is something very matter of fact about these windows. Not really the hortus conclusus that we usually find Medieval Mary in, but definitely a nod to it. The overall effect is a whirl of dancing colour that weaves its spell on your soul. Fairford became a rich wool town because Europeans were busy destroying their infrastructure in the 100 Years’ War. Gloucestershire is particularly suited to sheep farming, and the area prospered so much that they were able to afford a lavish new church. A medieval church was the honour of it’s town, and parishioners would have fallen over each other to endow it. Oddly, if there had been no Reformation, the City of London might still be an artistic centre of England, instead of the stock exchange. 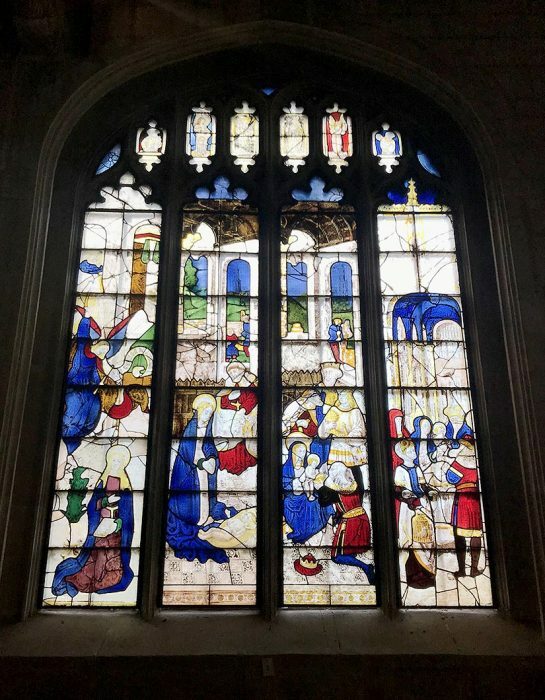 Stained glass in England was mainly made in the City of London, along with Opus Anglicanum needlework, and exquisite bishops robes that were exported all across Europe. There were rival Flemish glaziers who had set up south of the river in Southwark, and it is thought that this glass was designed by an artist from the Balkans who had trained under Memling in Flanders, and manufactured in a workshop in Westminster. Imagine a world in which England led the way in art, not in money markets. Fairford’s legacy gives a luminous insight into the graceful and opulent atmosphere of a Medieval English church. It is a soothing inspiration and well worth a visit; a monument to a time when Christianity was joyful, beautiful and very popular in England’s green and pleasant land.